Sofapaka's John Baraza has been named the March Coach of the month. 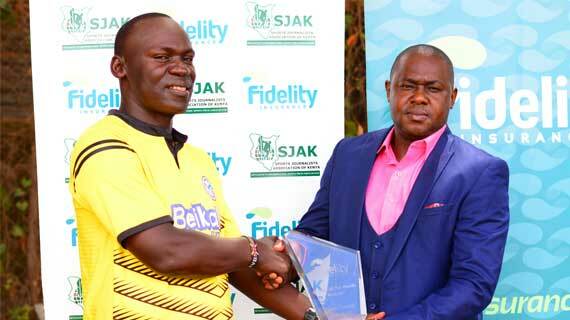 Sofapaka’s youthful tactician John Baraza has been named the Fidelity Insurance/Sports Journalist Association of Kenya (SJAK) Coach of the month of March having guided the 2009 champions to four straight wins last month as they continued their resurgence. Baraza beat off competition from AFC Leopards Rwandese boss Cassa Mbungo as well as Gor Mahia’s Hassan Oktay, having obtained more votes from the SJAK football commission. Mbungo picked three wins, a draw and a loss while Oktay had three wins. Baraza who took charge of the team early in the season after the departure of Melis Medo saw the side revive their fortunes after a disastrous start and their performance in March propelled them to the top of the standings before holders Gor caught up. “I am very pleased with the award today but this would not have been achieved without the good work from my players and members of the technical bench. We always work together as a team and this are the results,” Baraza said. Sofapaka began the month with a 1-0 home victory over KCB before travelling away to Awasi and bagging a comfortable 3-0 win over Chemelil Sugar. They then moved to Kakamega and beat AFC Leopards 1-0 at Bukhungu before winding up the month with a 3-1 victory over Mount Kenya United, one over their former coach Medo. Batoto ba Mungu have now scored a double in the monthly awards with their striker Umaru Kassumba having been earlier awarded as the February player of the month.